The Truss armchair combines an elegant, yet practical design with a lean, refined profile that spares no expense to comfort. Pictured above in our mixed-media offering of ebony fossil, the Truss line is available in a range of carefully-chosen upholstery options including high-performing fabrics by Maharam, our signature fabric and leather combination, and Italian leathers. 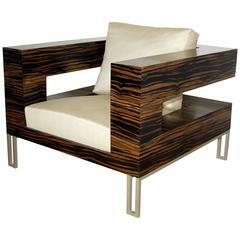 Each piece is designed in-house and made-to-order in the USA by skilled craftsmen. Down-wrapped, high-resiliency foam seat cushions. Poly-filled back cushions that retain their shape. Custom-designed, powder-coated steel T-shaped legs. 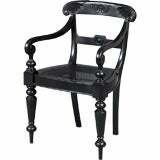 Anglo-Indian solid ebony armchair with carved top rail, scroll arms, caned drop-in seat, raised on carved and turned tapered octagonal-shaped legs. 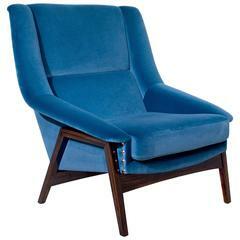 Armchair prima in cotton velvet with ebony wood veneer feet with glossy varnish and golden polished nails. Available in blue, green, red, grey and orange. 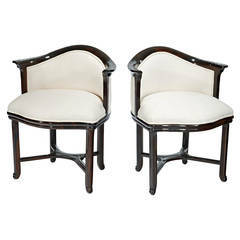 A beautiful pair of documented Majorelle armchairs in a hand polished solid Macassar ebony frame with silk upholstery. 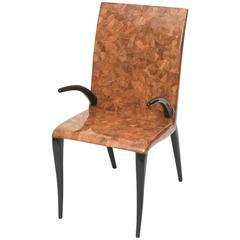 The back and seat of coconut and tobacco under resin, the arms and legs of ebony wood, metal label R & Y Augousti- Paris.